Cheap Thrills - Boston: SUN 4/22: Free Grilled Cheese! SUN 4/22: Free Grilled Cheese! In case you're wondering, there is other cheapness on the calendar. It may not be a good day for a picnic or a boat ride, but have a happy Earth Day! 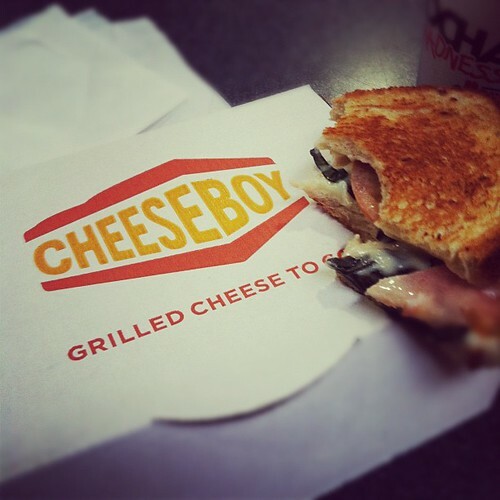 Swing by South Station or Prudential Center or Natick Mall or South Shore Plaza or even Providence Place for a complimentary "Cheeseboy Classic" (American cheese on Italian bread) in celebration of National Grilled Cheese Month.